Jennifer Richmond is a long-time friend, mommy extraordinaire, baker, chef and accomplished screenwriter! 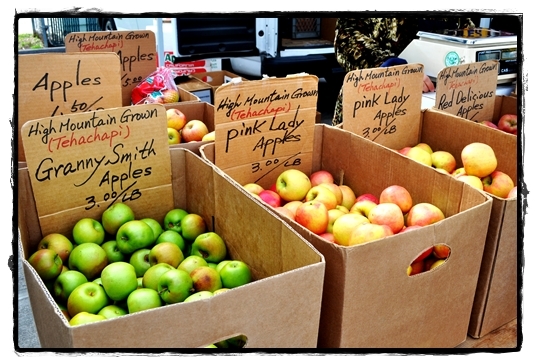 We are honored to have her Farmer’s Market musings here on Mommy Hiker! Please check out her Kitchy Cooking Blog linked in her bio below! One of my favorite things to do is make cookies and cakes, especially when my son helps me out. And while sweets are my first choice when it comes to cooking, I enjoy creating savory dishes for dinners and appetizers as well. But I don’t just use any old ingredients. I try to use fresh ingredients as often as I can. 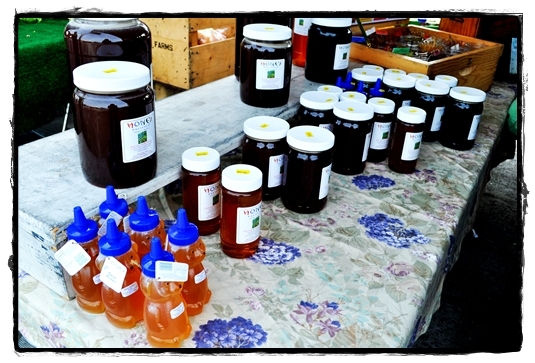 And fresh ingredients mean a weekly trip to the farmer’s market. I consider myself really blessed that I live in California. Not just because it’s in the high 60’s a lot of the year, but also because I have a farmers market I can visit each and every one of the 52 weeks that make up said year. I used to go to the market during the spring and summer when I could get all those delicious berries, stone fruits and heirloom tomatoes. But in the past couple years I’ve started to go during the fall and winter too because fruits aren’t the only things that taste better at the farmer’s market. Turns out the vegetables taste better too. 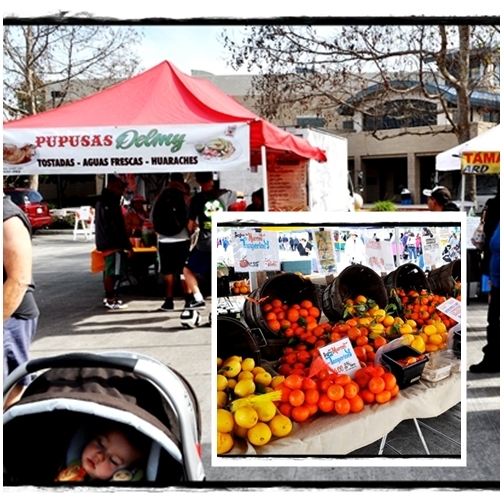 You’re probably wondering how a trip to the farmers market ended up on a mommy blog or how this has to do with children. It sounds more like it belongs on a food blog, right? Well, while I do use all the fruits and vegetables that I buy in the recipes I make, I also use it as an outdoor adventure for my two sons. It started when Aidan was a newborn. See, I needed to get out of the house with my infant and getting some fresh fruit out in the summer sun seemed like a great distraction for an hour. I was right. Although he’d end up falling asleep in the Ergo most of the time, he was always happy and excited when we first got there. All that brightly colored produce gave him tons to look at. As the months passed and Aidan started eating solids, the trip became even more fun because now I could use the fresh, organic produce to make his baby food. And once he had teeth, he could sample all the fruit at the market and help pick the strawberries or peaches he liked best. 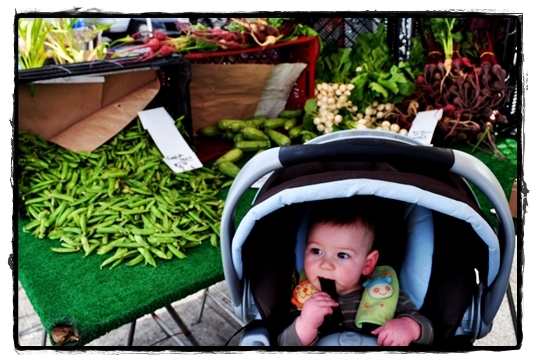 But the best thing about taking Aidan (and now Tommy) to the market was that since he was helping pick out the produce I was using in my cooking, he was more open to eating the dinners I made with it. While Aidan no longer makes the weekly trip to market because he’s in preschool, I still go; only now I’m taking his little brother. Tommy may still be too young to sample all the deliciousness, but I know it’s just a matter of time. I’m Jennifer Richmond and I’m a stay-at-home mom who loves to cook and write. I also adore the 40’s and 50’s. So I figured I’d combine these passions and create my own food blog, Kitchy Cooking. There I cover everything from sweet treats to savory dinner ideas, all using the freshest ingredients I can find. ← When Active Kids Get Sick!